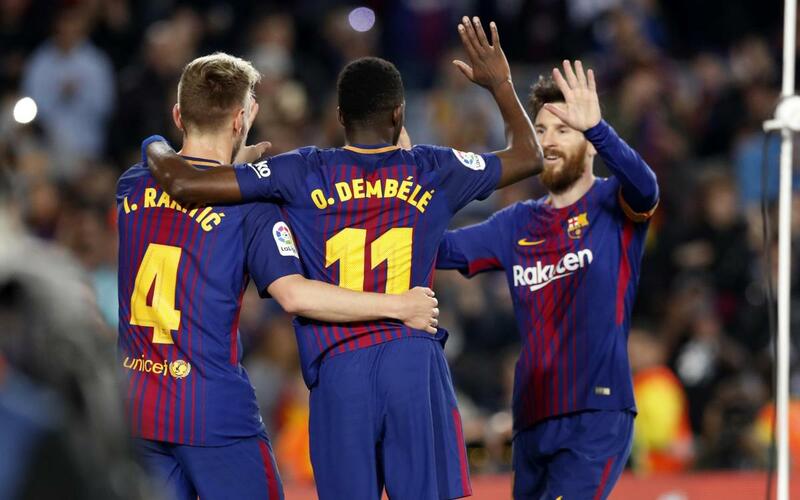 FC Barcelona powered their way to victory in Wednesday’s midweek fixture with a five-goal display featuring goals from three of the new additions to Ernesto Valverde’s squad. Villarreal were outclassed for long periods of the play and the win leaves the Catalans just 180 minutes from completing a historic Liga season undefeated. It took just eleven minutes for them to take the lead. Ousmane Dembélé powered his way through a sea of yellow shirts and although Sergio Asenjo was able to block the shot, Philippe Coutinho was quickest to react and smacked the rebound into the net. Mere moments later a wonderful team effort saw Barça’s lead doubled. A typically seamless Andrés Iniesta through-ball, a wee dink sideways from Lucas Digne and all Paulinho had to do was tap it in. It was footballing poetry and Barça looked to have this one sewn up with 75 minutes still to play. Villarreal, looking for points to confirm a Europa League berth, were barely getting a look in. Bang on half time, it was three. Leo Messi couldn’t find a way through. So he popped it back to departing maestro Iniesta, who delivered it back over the top and there was the Argentinian to move a goal closer to a record fifth Golden Shoe. A stroke of fortune got the visitors off the mark moments after the restart. Nicola Sansone found himself in the way of team-mate Pablo Fornals’ strike, and ended up deflecting it out of reach of Jasper Cillessen, who was relieving Ter Stegen of his goalkeeping duties for the evening. A couple of late wonder-goals from Dembélé sent the fans off home in raptures. The first was really the work of Ivan Rakitic. What a run, nutmeg included, by the Croatian, and all the Frenchman had to do was finish off the job. But the former Dortmund man was entirely to thank for his second, and Barça’s fifth. A dazzling run from the halfway line, and a terrific lob to finish, was the perfect end to the perfect evening from the league and cup champions. Barça have now gone for twenty consecutive games without losing to Villarreal – their second longest run against any team. And who’s top of the list? It’s Levante, who haven’t beaten Barça in 22 games.